Peanut Butter Banana Bundt Cake is the most perfect cake recipe ever. 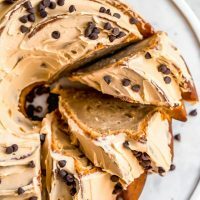 Peanut butter and banana is one of those classic flavor combinations you just can't beat, and when you add peanut butter icing and mini chocolate chips into the equation, YUM! This peanut butter banana pudding cake is great for any occasion, and easy enough for new bakers. Combine cake mix, puddings, oil, water and eggs and mix in an electric mixer. Add in the peanut butter and mashed bananas and mix until smooth. Pour batter into cake pan and bake 40-45 minutes or until toothpick inserted comes out clean. Once the cake has cooled for at least 10 minutes, flip it over and place on a platter or plate. Allow to cool completely before adding icing. combine powdered sugar, softened butter, and milk with an electric mixer. Add the peanut butter and mix until fluffy and smooth.